Still looking for that perfect gift for someone on your list? Cyber Monday starts early! Don’t miss our BEST savings of the year. Find the perfect gift of a scenic view for someone on your list or a special piece of window frame wall art for yourself. How about a tropical view to become your new happy place. Or maybe one of your goals is to climb a high mountain peak or you already have and this view below of Colorado’s Longs Peak at 14,256 feet will inspire you every day on a wall that is crying for a window. It is like having a view of the outside, but you get to choose the view you want to see when you look out your window’. Window frame view Art is an excellent choice for window-less office settings, waiting rooms, child care facilities, or anywhere else that an extra view of the outdoors would inspire or refresh someone. They can be added to any décor in your home and enhance any setting. By choosing the right window art you could create a theme within a room as well. Rather than staring at a blank wall, why not have a beautiful lake to look at whenever you want to. You could be staring at a nice mountain view or maybe a calm forest scene will start your day out right. Adding these pieces to your current décor will make you the envy of your friends. Everyone will want to know where you got your beautiful art from, and what an excellent idea. Anyone can put art on their walls, but having an extra window that is also beautiful is something any art enthusiast could appreciate. A home’s beauty becomes tenfold when it has an amazing view from its windows. Think of a stunning view of the sunset as one by one the afternoon sea waves kiss the fine sandy shore. Imagine a garden of blooming daffodils greeting you each morning. Window view art is the solution to the problems of windowless rooms. With the use of hi res images and professionally crafted masterpieces, your windowless rooms can still be given that vibrant feel. Beautiful canvas wraps with majestic designs complete the look of your room the whole year round. For instance, wake up to the calming view of a Colorado lake with a hi res canvass print window art. You can bring the beauty of Mother Nature inside your room wake up to it every single day. Do you have rooms in your house without windows? Have a den or recreation room downstairs with no view of the outside world? You should be looking into window view art! It is the wonderful way to bring life back into any room in your house or apartment. It is like having a view of the outside, but you get to choose the view you want to see when you look out your window’. The art on these canvasses is beautiful all by itself, but the fact that it adds a window-like feel at the same time gives you a way to dress up any dark corner or wall in your home. 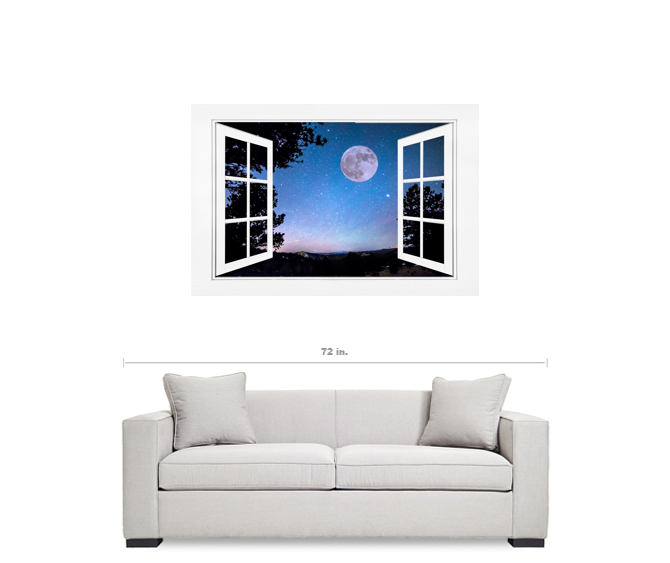 Window View Art has a wide array of sizes and styles to choose from. If you have that wall in your house that you always wished had a window, but you don’t want all of the construction costs and mess, this is the perfect option for you. Imagine having a mountain view to look at whenever you want, or maybe you want a beautiful meadow to view, either way you will have the view you want from the comfort of wherever you are sitting. Maybe you would like to look out at the desert or see a horse running, one of these wonderful canvasses could give you the scene you are looking for. Window View Art is an excellent choice for office settings, waiting rooms, child care facilities, or anywhere else that an extra view of the outdoors would inspire or refresh someone. They can be added to any décor in your home and enhance any setting. By choosing the right window art you could create a theme within a room as well. Many counselors and doctors use rooms without windows, and window art would be a perfect way to create comfort in your patients and clients. You could offer them the illusion of looking outside and ease anxieties, especially for people who have a fear of enclosed spaces. Window art is an excellent way to bring new life to any place and would be an excellent choice for any room that simply needs a little more warmth. You may simply want a change of scenery once in a while. Maybe you want to look out a the beach or have palm trees to look at during the winter. You can have different windows for different seasons if you like. You may enjoy having a snowy scene to look at on those hot days, or maybe you are longing for a place you used to go. Find some window view art that suits your needs and tweaks those good memories. Look around the room you are in right now, could it use some more windows? Would you like to be looking at the view of your own choosing? 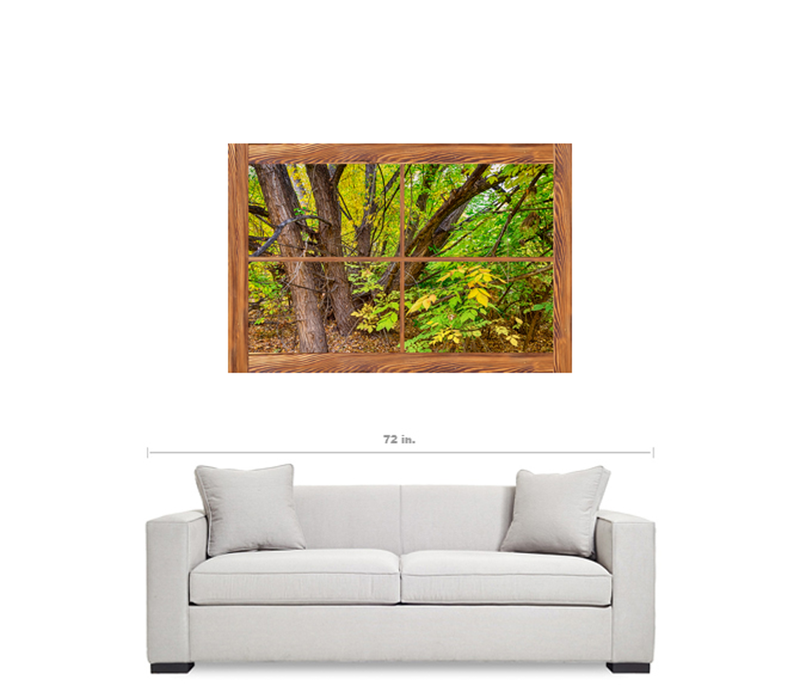 Let Window View Art custom make a piece for you from their wide array of images. You will receive a high-quality canvas that has been crafted to last a long time. Each piece is printed in high resolution and if finished off with a scratch resistant coating to make sure it will remain a brilliant wall covering for years to come. When you are thinking about redoing rooms over the long winter, why not consider adding a few windows to current décor. There is an excellent selection to choose from and scenery for everyone to enjoy. You can create an illusion of more openness in your own home while adding vibrant colors to your current scheme. I think you will find that window view art can only enhance what you already have. Take advantage of the great deals at windowviewart.com and get some high-quality art product made in the U.S.A. Sign up for our newsletter and get a save 15% off coupon. How about a picture window out a posh and elegant view of downtown city lights complete with a rainbow colored splash of LED lights and buildings. Visualize the bustling city thrills right from your window. Yes, all these picturesque sceneries are the perfect views from our windows. Whether it’s our home, a commercial space, a dynamic trade booth or your corporate office space, a great view from your window is a must. But what if your room has no windows? Do you stand no chance of enjoying these amazing sceneries? Is your room deprived of the beauty of the world outside? Commercial spaces become more appealing with the use of fine prints. Window view art creations for restaurants and cafes accentuate the elegance of the place itself. Try using a scenic view of Majestic Colorado Longs Peak and use it to give life to your coffee shop’s wall. Instead of a lifeless area of concrete, your wall now becomes the perfect accessory to your main product – finely brewed coffee. NEW Picture Windows Frames are added regularly. Please Subscribe to our email list for new art added, promotions and Savings Codes. Do you have a home or office room without any windows? Do you want to set the mood in a room decor? Do you dream of a room with a view? 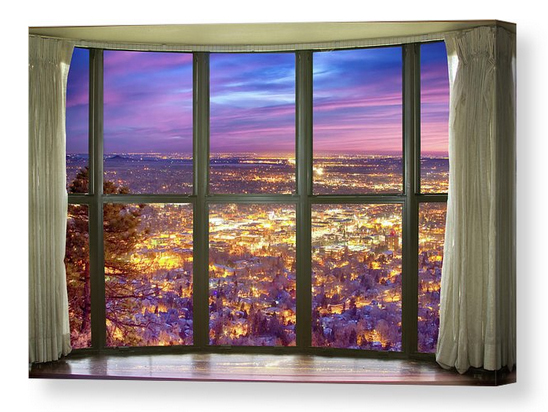 The Answer: Now you can have a window with a view in any room with our NEW picture window view fine art striking nature landscape canvas wraps with a view. The Image is the frame, how cool is that? Please note: The Window Frame is part of the image.